Thank you for purchasing our products. This manual addresses the safety guidelines, warranty and operating instructions. Please review this manual thoroughly before operating your device. The device contains electrical equipment that may cause injury if not used properly. For example, prolonged contact may contribute to skin allergies for some users. To reduce irritation, please read the safety guidelines on the following pages to ensure proper use and care. ● Do not expose your device to liquid, moisture, humidity or rain while charging; do not charge your device when it is wet, as it may result in electric shock and injury. ● Keep your device clean and dry. Do not use abrasive cleaners to clean your device. ● Consult your doctor before use if you have any preexisting conditions that might be affected by using this device. ● Don’t wear it too tight. If your device feels hot or warm, or if it causes any skin irritation or discomfort, please discontinue using your device and consult your doctor. ● Do not expose your fitness tracker to extremely high or low temperatures. ● Do not leave your fitness tracker near open flames such as cooking stoves, candles, or fireplaces. ● This product is NOT a toy – never allow children or pet to play with this product. Always store the product out of reach from children. The devices themselves or the many small parts they contain may cause choking if ingested. ● Never try to abuse, crush, open, repair or disassemble this device. Doing so will void the warranty and can result in a safety hazard. ● If any parts of your product require replacement for any reason, including normal wear and tear or breakage, please contact us. ● Do not use your device in a sauna or steam room. ● Do not bring your device into contact with any sharp objects, as this could cause scratches and damages. ● For light colored arm bands, minimize direct contact with dark-colored clothing, as color transfer could occur. ● Dispose of this device, the device’s battery and its package in accordance with local regulations. ● Don’t not check any notifications, GPS, or any information on your device’s display while driving or in other situations where distractions could cause injury or hazardous. Always be aware of your surroundings while exercising. ● Do NOT disassemble, modify, re manufacture, puncture or damage the device or batteries. ● Do NOT remove or attempt to remove the non-user-replaceable battery. ● Do NOT expose the device or batteries to fire, explosion, or other hazard. ● If you have a pacemaker or other internal electronic device, consult your physician before using a heart rate monitor. ● The optical wrist heart rate monitor emits green light and flashes occasionally. Consult your physician if you have epilepsy or are sensitive to flashing lights. ● Always consult your physician before beginning or modifying any exercise program. 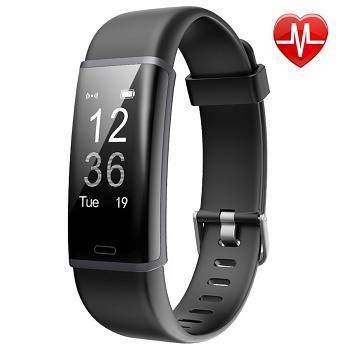 ● The device, accessories, heart rate monitor, and related data are intended to be used only for recreational purposes and not for medical purposes, and are not intended to diagnose, monitor, treat, cure, or prevent any disease or condition. ● The heart rate readings are for reference only, and no responsibility is accepted for the consequences of any erroneous readings. While the optical wrist heart rate monitor technology typically provides the best estimate of a user’s heart rate, there are inherent limitations with the technology that may cause some of the heart rate readings to be inaccurate under certain circumstances, including the user’s physical characteristics, fit of the device, and type and intensity of activity. ● The activity tracker relies on sensors that track your movement and other metrics. The data and information provided by these devices is intended to be a close estimation of your activity and metrics tracked, but may not be completely accurate, including step, sleep, distance, heart rate, and calorie data. ● If you have eczema, allergies or asthma, you may be more likely to experience a skin irritation or allergy from a wearable device. ● Whether you have the conditions above or not, if you start to experience any discomfort or skin irritation on your wrist, remove your device. If symptoms persist longer than 2-3 days of not using your device, contact your doctor. ● If you sweat for more than two hours while wearing your fitness tracker, be sure to clean and dry your band and your wrist to avoid skin irritation. ● Prolonged rubbing and pressure may irritate the skin, so give your wrist a break by removing the band for an hour after extended wear. ● Regularly clean your wrist and the fitness tracker, especially after sweating in the exercise or being exposed to substances such as soap or detergent which may attach on the internal side of the tracker. ● Do NOT wash the fitness tracker with household cleanser. Please use soapless detergent, rinse thoroughly and wipe with a piece of soft towel or napkin. ● While the fitness tracker is water resistant, it’s not good for your skin to wear a wet band. ● If your bands get wet—like after sweating or showering—clean and dry them thoroughly before putting them back on your wrist. ● Be sure your skin is dry before you put your bands back on. We strives to build our products with the highest attention to detail and craftsmanship. However, sometimes there are occurrences of defect. 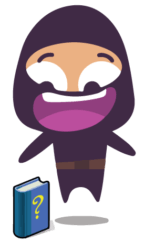 We are happy to offer 1-year hassle-free warranty to all our devices as we continue to make amazing products. Please contact us if you have any questions about our devices. Please charge your new device for 10 minutes before initial use. If the charging red indicator is not on when you plug the device in a USB port for charging, check the direction of the device’s charging plug and move to the correct direction. Make sure the pins on the charging plug contact the pins in the USB port. Option 1: Search for “VeryFitPro” in APP store or Google Play. Once APP is located, please download and install it to your smart phone. 1) This fitness device is for iOS 7.1 & above or Android 4.4 & above. Please refer to the operate system above for device compatibility. 2) “VeryFitPro” APP is only compatible with smart phones.Option 2: Scan QR code to search for the APP. Use a QR scanner to search for the “VeryFitPro” APP in the APP store or Google Play. For optimal binding and function of your device, please make sure your device has been charged for at least 10 minutes before initial use. Note: The device is fully charged after 1 hour. 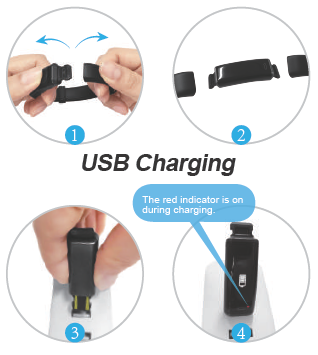 Charging: remove the host from the wrist band by gently pulling the band out of the host; connect the device host to a normal DC USB port (5V-500mA). 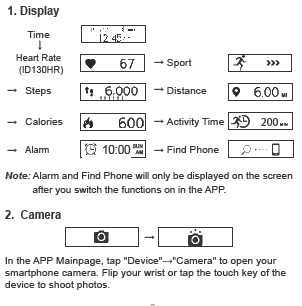 1) The fitness trackers screen needs to be awake (tap the touch key to light the screen) to bind with your smart phone. If bind failed, wake up your tracker and restart device search. 2) If you unbind the device under Bluetooth connected state, the APP will set the settings back to default and all the data on device will be cleared. If you unbind the device under Bluetooth disconnected state, the APP will set the settings back to default, but the data on device will not be cleared. 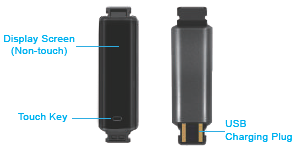 3) The device can only link to one Bluetooth device at a time. During connecting please confirm there is no other Bluetooth devices nearby. When a call or message comes in, the device will enter call/message alert mode. After the alert, it will go back to the previous mode. Record daily activities. You can check daily activity data including steps, distance and calorie burned on the APP. Device can automatically recognize your state and monitoring the whole sleep progress with deep sleep, light sleep and awake sleep hours record. Alarm alert, call alert, sedentary alert, etc. with silent vibration. Use the tracker to control smartphone shooting photos. Monitor your heart rate status and help you make proper exercise plan. Make sure the direction of the device’s USB plug is correct when plugging into the USB port for charging. For correct charging, the device’s red indicator turns on and will be off when the device has been fully charged. Warm tips: Please remove the device host from the power supply once fully charged. Prolonged charging may shorten the battery’s life. 1) Make sure the Bluetooth of your smartphone is ON. 2) Make sure the distance between your smartphone and the device is within 0.5 meter. “VeryFitPro” APP and enabling the Location and all Notifications. “Bind device”, then your smartphone starts searching devices. Select “ID130” or “ID130HR” in the list of found devices, and tap “ID130” or “ID130HR” to connect the device to your smartphone. 6) If you failed search the device, reboot your smartphone and Bluetooth to search it again. Device” and turn off Bluetooth. 1) Go to your smartphone system Settings, find “VeryFitPro” APP and enable the Location and all Notifications. (Specific setting methods may vary according to different smartphones. 2) Turn Bluetooth on and go to the “VeryFitPro” APP to bind the device. 3) Switch “Call/SNS Alert” function on, and click ” √ ” to save your settings. Regarding the step counting, this fitness tracker has a built-in 3D sensor. It registers your steps when you swing your arm. Sometimes the data on device may displayed a little delayed. And it will reset itself if you walk continuously less than 10 steps. To test the accuracy of the pedometer, please walk casually and continuously up to 100 steps or more. Make sure the wrist band sits neatly on your wrist before use. 10~20s to detect the heart rate. APP and swipe down Mainpage under connected state. sleeping status based on your wrist action or body movement. over 2 hours from 0:00 to 24:00). please make sure your personal info on your APP is updated. screen to synchronize data to the APP). hands without taking it off, but do not shower or swim with it. smartphone is set mute, it only vibrates once and stops). go to the APP → “Device” → “More” → “Display Mode”). it with your hand in the sunshine or daylight to see more clearly. please contact seller in time. 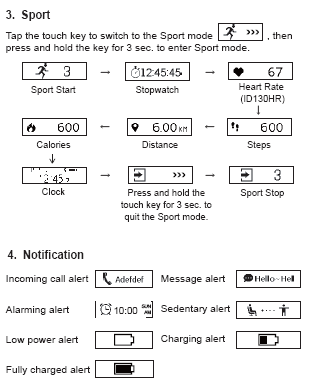 best information available in a wearable activity tracker. Questions about your ID130HR / ID130 User Manual ? Post in the comments!